(0 Customer Reviews) | Write Review 4 issues per year Damaged is the new magazine from Abteilung 502, and also the newest member of AK’s big family. This new publication wants to show modellers how to weather any type of subject, under any condition and with various effects. Fernando Vallejo, AK’s President, takes matters into his own hands and selects all the best modellers to showcase their best models, creations and special curiosities. 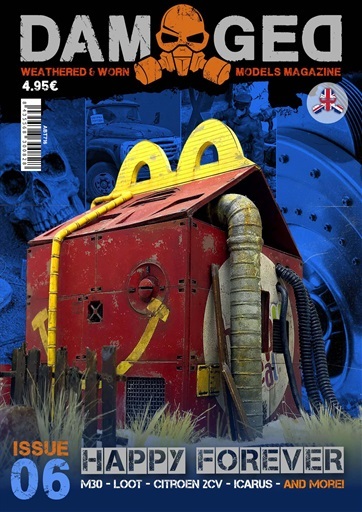 Inside this magazine you can find various subjects, such as trucks, ships, tanks, spaceships, trains, etc. Damaged is the manual for weathered and worn models. Damaged is the new magazine from Abteilung 502, and also the newest member of AK’s big family. This new publication wants to show modellers how to weather any type of subject, under any condition and with various effects. Fernando Vallejo, AK’s President, takes matters into his own hands and selects all the best modellers to showcase their best models, creations and special curiosities. 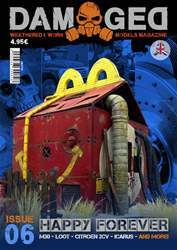 Inside this magazine you can find various subjects, such as trucks, ships, tanks, spaceships, trains, etc. Damaged is the manual for weathered and worn models. You'll receive 4 issues during a 1 year Damaged Magazine magazine subscription. You'll receive 4 issues during a 1 year Damaged Magazine magazine print subscription.